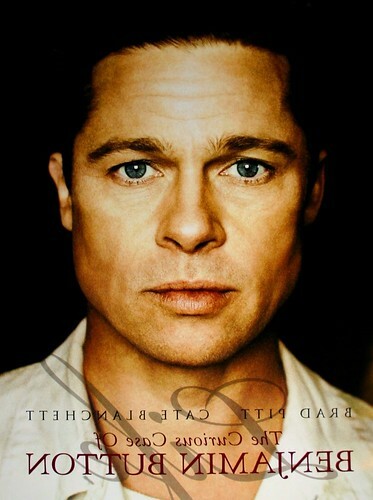 The Curious Case of Benjamin Button: 6.5 out of 10. The Curious Case of Benjamin Button was one of five films I watched during yesterday's AMC Best Picture Showcase at Yonge and Dundas. After watching Milk and The Reader, I was left underwhelmed by The Curious Case of Benjamin Button. It was very long, and a shadow of a similar movie I enjoyed a great deal more. Yes, I'm referring to Forrest Gump, a movie ten times better than The Curious Case of Benjamin Button. Seriously, Eric Roth penned both screenplays. He essentially watered down Forrest Gump here, with similarities you can't ignore. Here's a spoof that does a pretty good job explaining the parallels. I was also underwhelmed by Brad Pitt's performance. He was better in another David Fincher film we know and love. I'm surprised The Curious Case of Benjamin Button was even nominated for Best Picture, considering both The Wrestler and Wall-E were superior, in my humble opinion. I don't care what anyone says, Brad Pitt is still hot for his age - even WITH that beard!